In recent years as we all try to lose weight, carbohydrates seem to have come under fire as many worry about the potential weight gain. Others might be more concerned about the health effects that comes along with the consumption of carbohydrates. This article aims to share what carbohydrates are and what its relationship with exercise is. The article has been split into 2 parts. For those who already know what carbohydrates are, it is suggested that you go straight to the second part: Carbohydrates and exercise. Bread, pasta, pancakes, grains, vegetables, fruits; To us, these are some of the many forms of carbohydrates. To the body however, carbohydrates are seen as its favorite source of energy. This is because carbohydrates are easy to break down and produces high amount of power when used. Categorically speaking, we can generally look at them as sugar, starches, vegetables and fruits. A more common way to look at carbohydrates is in accordance to it’s Glycemic Index (GI). GI is a method of ranking cabrohydrates based on their blood glucose response and is determined by the rate your carbohydrate is digested into your blood glucose level. In this case, carbohydrates are ranked by the GI as High (<70), Moderate (50-70) or low GI (>50), with glucose set at 100. The GI ranking is based on a standard food such as glucose or white bread, which is given the ranking of 100. 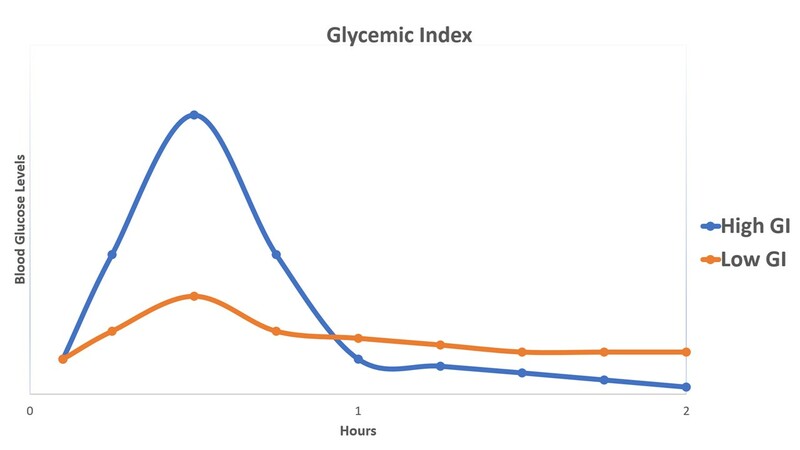 As you can see on the graph, higher GI food tend spike your blood glucose within the first hour, but crashes after while lower GI food gives a more stable rate of energy on your blood glucose levels. For this reason, in recent years high GI food has been given the name “Bad carbs”, but these food might be exactly what you need when you exercise, which we’ll explore later on in the article. The glycemic load (GL) represents the quality and quantity of the carbohydrate source and is calculated by multiplying GI with the weight of the food. Carbohydrate food high in GL are expected to increase blood glucose greater. In this case, carbohydrates are ranked by the GL as High (<20), Moderate (11-20) or low GI (1-10). A food high in GI may not necessarily be high in GL. Table 2 shows the ranking of GI and GL while table 3 shares some examples of carbohydrate food with different GI and GL. After eating your favorite pasta dish, carbohydrates enters the body and are stored as glycogen. However, glycogen stores in the body is small (about 500g in total, stored in muscles and liver). When glycogen stores are fully stored, the excess carbohydrates in the body will then be converted to our unlimited storage: fats. When and how do carbohydrates become used in the body? Carbohydrates are used when you eat, sleep, play and even work. As long as your body needs to use energy, carbohydrates will be used. 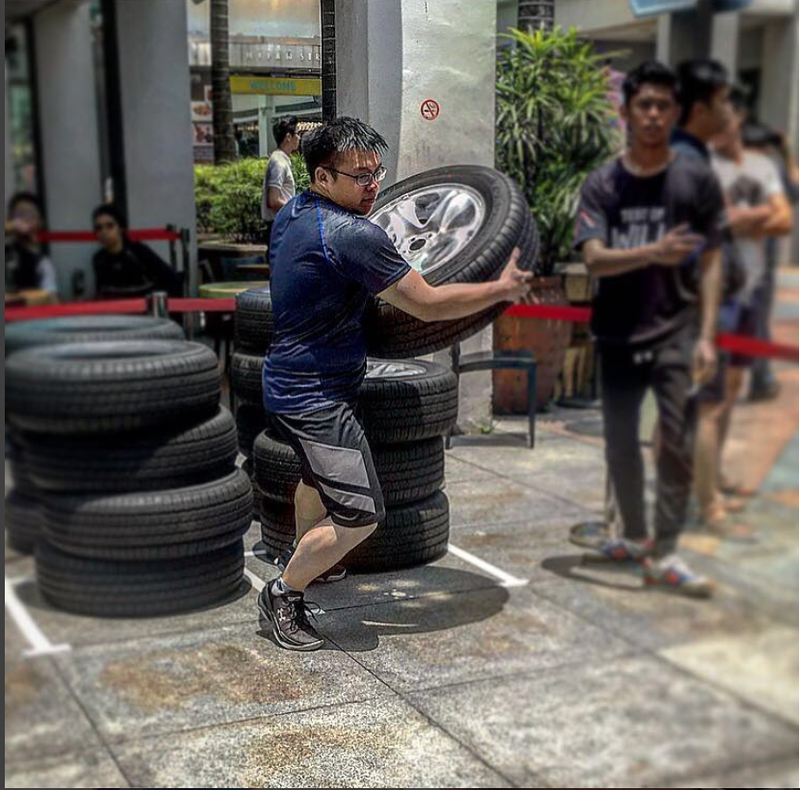 However, the rate of carbohydrates used differs according to the intensity of your activity. 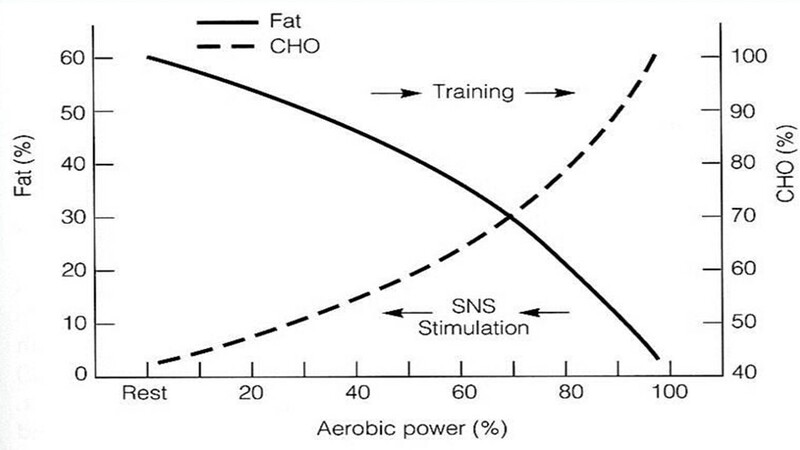 As shown in Figure 2, a higher intensity activity such as sprinting or basketball will require more carbohydrates compared to a low to moderate activity. At the lower intensities, fat is being used more. This would also explain why you tend to find yourself losing energy faster when you’re doing a sprint, while you tend to last longer when you perform a slow jog. Carbohydrates and Exercise: What’s the relevance? Knowing information is awesome, but let’s go one step further and explore application: How can I use carbohydrates to my advantage? Is there room for sugar to be awesome? Carbohydrates are particularly important for performances related to moderate to high intensities as your body will use more carbohydrates compared to other energy substrates. In general, the body uses 30-60g of cabrohydrate sources per hour during exercises. The use of carbohydrates in sports performance has seen improvements in sprint time, time to exhaustion, time trials, strength and even power performances. A paper in 2011 listed down the carbohydrate requirements for athletes in terms of training (Burke, Hawley, Wong & Jeukendrup, 2011), giving us a guideline of how much to consume in order to restore our carbohydrate fuels. When it comes to restoring glycogen energy stores, high GI carbohydrates [Sugar, Pop tarts, candies, gummies hurray!!!] are the best as they digest the fastest. This is especially important for athletes who’re in their competition season and needs to recover their glycogen stores fast. In the interest of recovering glycogen stores fast, it is recommended to consume carbohydrates immediately post exercise as that is the “window of opportunity” for the body to maximally saturate glycogen storage. Effective weight loss happens when you achieve true energy deficit on a daily basis. This means that the total amount of calories you consume must be lower than the the amount of total energy you expand. But that’s a whole other topic for another day. That said, carbohydrates serves as a good energy source when you’re exercising to lose weight and should not be avoided. How much carbohydrate you should consume depends on your total activity level. If you lead a sedentary lifestyle where you’re mostly sitting in the office to do work, you’ll probably would want to work with 1-2g/kg of carbohydrates. Consumption of high amounts of vegetables and some fruits are recommended. The best time to consume carbohydrates for weight loss would be post exercise so as to restore glycogen, thus reducing the chances of carbohydrates becoming stored as fats. 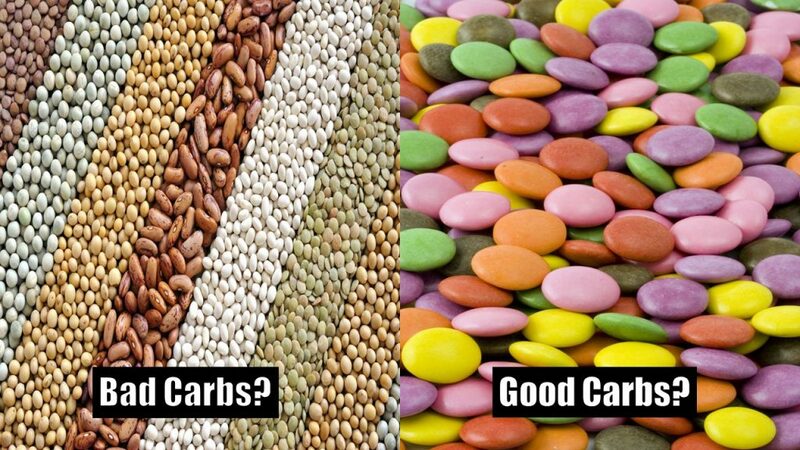 Carbohydrates still have a strong position to play in today’s diet and are definitely not irrelevant. If you’re an athlete training hard for competitions, carbohydrates will definitely play a part in your journey. To ensure optimal sports performance, during competition, it is recommended to consume carbohydrates according to table 4. It is also recommended to consume carbohydrates post exercise to restore glycogen stores. However, for off season athletes or individuals looking to manage your body composition by losing some weight, it’ll be recommended to consume sensible amounts of carbohydrates. That is to say, only consume what you need. After all, the best way to avoid weight gain is not eat the weight. 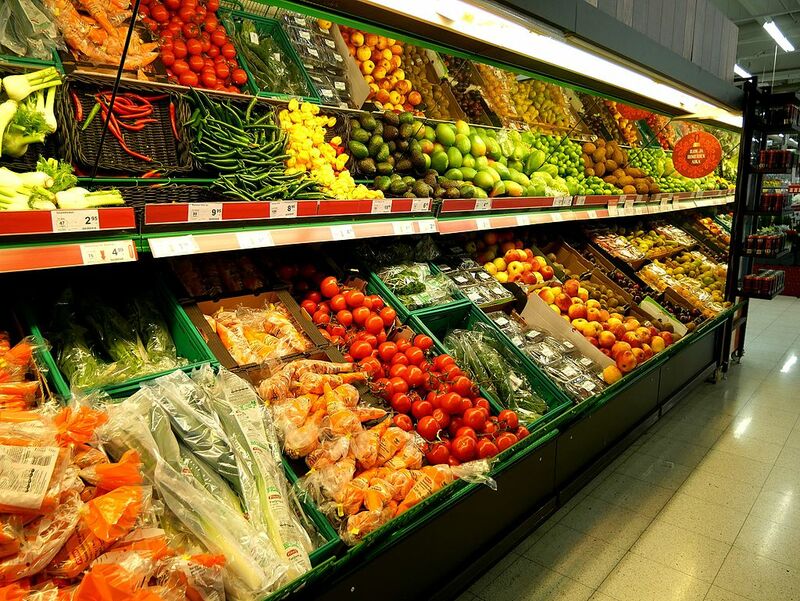 To ensure proper consumption of nutrients, it is recommended to consume most of your carbohydrates from vegetables and fruits and consume fuels such as sugar and starch food when you need it (eg. before or after exercising). B Kreider, R., D Wilborn, C., Taylor, L., Campbell, B., L Almada, A., & Collins, R. et al. (2017). ISSN exercise & sport nutrition review: research & recommendations. Journal Of The International Society Of Sports Nutrition, 7(7).